Unfortunately, I don’t think the ban will have the impact they hope, since I already know some stores are prepared to be fined. And my initial thought was ‘those aren’t the plastics that fill up my life’. But see…it did make me think. I started looking around and found a number of places where I could reduce my plastic usage with a few simple changes. But all of these changes needed to meet two overarching criteria: I like what I like and I tend towards laziness. A number of years ago, a local grocery store started to charge for plastic bags, offering reusable cloth bags as an alternative. Pretty soon, most of the stores in the area had followed suit. I switched over at the time, so this is something I had already mostly eliminated (except for when I forgot or needed to restock on the wet bathing suit bag stash – I’ll need to find an alternative for that). But there were still a number of areas I could reduce the plastic in my life. This was a big one for me. Well, not so much in the summer since I get a lot of my produce from my garden allotment. Even with the garden, and leaving a lot of the produce I buy unbagged, I still ended up using a fair number. I tend to buy a lot of things in bulk (oats, beans, chocolate-covered almonds) as well, which contributed a lot. So the two small changes I made had a big impact. First, I bought some reusable produce bags. I could have made them but…did I mention I was lazy? So far this has been going well. I think next time I would get some that were more see-through – sometimes it’s hard for tellers to see the codes. 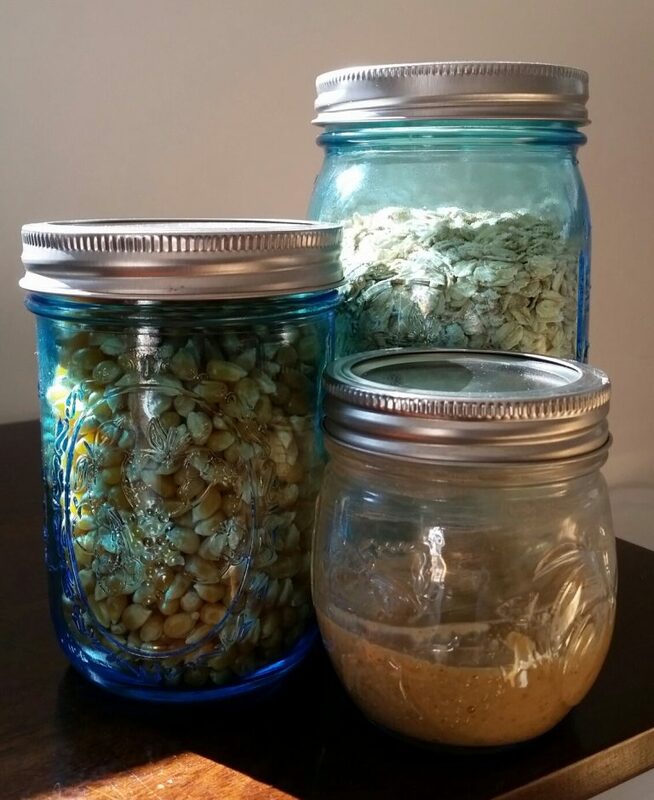 Second, I started shopping for my bulk food at stores that let me take my reusable containers – hello, mason jars! This one takes a little bit more planning, but there are two stores near where I work. One is a big, chain bulk food store that started allowing BYOCC (I added a clean in there) earlier this year; the second is a new ‘zero waste’ store – which I thought would be a lot more expensive than it was, just given the current hype around zero waste. Third…didn’t realize there was a third…I’ve started buying things in bulk that I used to buy in plastic bags. Things like shredded coconut, lentils, sugar, popcorn kernels. Now, these don’t come in the soft plastics that tend to be the worst, but I still saw the potential for change. All of my hummus and some of my nut butter come in plastic (and thinking about plastics got me thinking about the resources that go into recycling). I have an addiction to nut butter and a dependency on hummus, so I need some way to satisfy that need. So I’ve started making these at home. I’m not a great hummus maker, but I’m getting better. I tend to make it with lentils because, as I mentioned, I have a tendency towards laziness, and split red lentils cook in, what, 10 minutes? Nut butter takes a bit more dedication and planning, but it’s something I can work away at of an evening. Homemade tahini, however, was a fail. I’ve decide to continued buying my favourite tahini (which does come in a very recyclable glass jar). Another change that was pretty simple was switching from bottled shampoos and conditioner to bars. We’ll see how this one sticks, but so far I like the bars more than I thought I would. The challenge is finding unscented versions…the last thing I want when I’m feeling migraine-y is lavender-pine hair in my face. In the spirit of full disclosure, I figure I should mention some changes I haven’t made. The big one is that I still buy a lot of frozen fruit…berries for my overnight oats, berries for smoothies, berries to eat out hand when fresh ones aren’t in season. All those berries come in plastic bags. I have started buying bigger bags – there might be marginally less plastic, right? I need a little chest freezer so I can freeze more of the local berries. Another thing I hoped to be able to buy in bulk was laundry detergent, but – back to ‘I want what I want’ – it needs to be liquid and unscented (no lilac sunshine pillows next to my head when I’m migraine-y). I did discover the trendy zero waste store has some…after I bought a big container. Next time. Those are the changes I’ve made so far, but I don’t think they’ll be the last. Now that I’m looking at the products and packaging in my life with fresh eyes, I can see even more changes that won’t really impact my quality of life. And it’s making me think about the non-plastic impact I have on the planet…but that’s for another post. What about you? Are you trying to reduce the plastics in your life? If so, what are some of your successes or fails?